Mac OS X 10.6 Snow Leopard users can now add OS X Lion’s iOS-style Launchpad feature to their desktops with a free third party utility called MacLaunchPad. MacLaunchPad is pretty similar to the real thing, and some features are closer to the version of Launchpad that appears in OS X Mountain Lion, like the real-time app search function. You can set some customizations that don’t exist in the Lion version too, like giving you the ability to change the amount of visible icons per Launchpad page. As usual with Launchpad, you can set hot keys to activate and deactivate the app, or even arrange and uninstall apps directly from the panels. MacLaunchpad is compatible with Mac OS X 10.6 Snow Leopard and Mac OS X 10.5.8 Leopard. No thanks.. I downgraded from Lion to Snow Leopard because of the instability with my mid year 2007 imac.. I’m not gonna ruin that by adding Launchpad. Why? I’m trying to forget the iPadic mess Lion is. Better close your eyes for Mountain Lion then, it’s more iPadic than Lion ever was. – not the Mac way we love. So sad. Looks like mountain lion will be worst. It’s always about money. People are getting stupid, stupid people getting money, operation systems are becoming stupid, Apple getting more money. Rename a few apps and Mountain Lion is basically Lion. It’s quite different for developers with sandboxing and gatekeeper, but the end user will barely notice the difference except for the improved iOS syncing apps. You’re right! I really miss late 2007 when Leopard was released. It was the best Mac ever. Does anyone actually use Launchpad? No one I know does. The Dock for common apps and Spotlight to launch all the others, but Launchpad is a pain. I do too. But I’ve started on Lion. This is maybe the difference. It all the time depend on angle of view. In my eyes is launchpad a good alternative to run not so often runned programs. Programs I use very very often, I have in dock as others. But I use 13″ MacBook Pro and don’t want to have so small icons there. Than launchpad is great stuff because I can manage programs into groups and always know where theese programs are. Helpful for me. Surely easier way than open finder and search or use spotlight to find app I want. I still use the snow leopard. And I will use it in the future, till the time Apple release a classic Macintosh OS like snow leopard or leopard. I’m bored of lions, mountain lions and operating systems that looks like ipad, tablets and same sheets. And the best solution i think is: Apple released OSx Lion, mountain whatever, but they need to release and a second version of the OS. 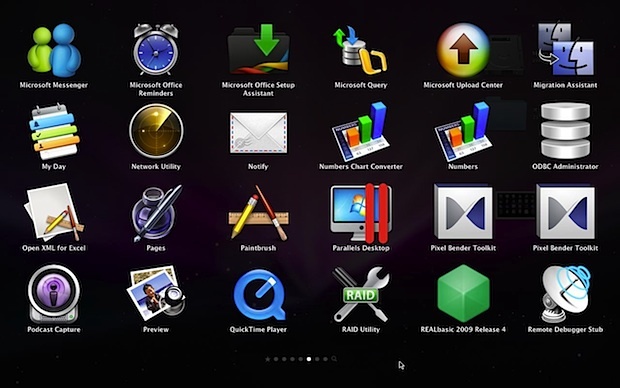 For example OSx for and based on ipad, isheets etc, and OSx for Macintosh computers. A nice idea, but it launches way too slowly (and I’m on an SSD), and I couldn’t get the keyboard shortcuts to work. Even mountain lion, the animal, looks odd. I miss you, Steve. Miss You Steve. Apple Really needs you!! Lion Has just gone down but snow leopard will be the best!!! The application itself is a Universal binary, but it requires Adobe Air, which is Intel only. Sorry PPC users. That said, the application is an interesting but not quite polished substitute for Launchpad. I kinda like how it is an application that quits after used, so it doesn’t waste resources. But on my 2007 MacBook it still lags a bit. Other issues are that keyboard shortcuts don’t work and that some icons are the wrong size (huge or tiny). But it’s still beta and as long as those are ironed out, it’s okay. Those of you complaining about Launchpad in 10.7+, be happy that it’s completely optional. It isn’t forced down your throat like the exclusion of a proper save feature (now that was irritating). And on top of that it works quite well if you need to quickly access an application or two.